Obama Taps Ex-Utility Exec. For Commerce Post : It's All Politics President Obama has chosen his new commerce secretary. He's John Bryson, former chief executive of Edison International, the large Southern California electric utility. By choosing Bryson, 67, who sits on the boards of Boeing and Walt Disney Co., Obama sends another pro-business signal. 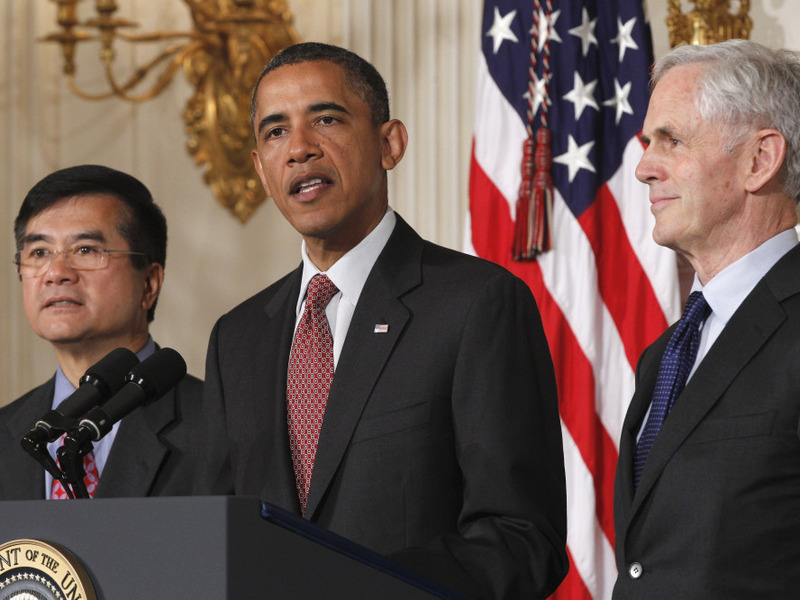 President Obama with John Bryson (r), his Commerce Secretary nominee, right, and current Gary Locke, the current secretary, Tuesday, May 31, 2011. President Obama has chosen his new commerce secretary. He's John Bryson, former chief executive of Edison International, the large Southern California electric utility. By choosing Bryson, 67, who sits on the boards of Boeing and Walt Disney Co., the president appears to be sending another pro-business signal to corporate America. Should Bryson be confirmed by the Senate, he would provide the president with another administration member well-connected to the U.S. business community. For much of his presidency business types, like the U.S. Chamber of Commerce, have criticized Obama for policies they allege place too many burdens, regulatory and otherwise, on U.S. companies. Obama has sought to reverse that. His appointment of former Clinton administration Commerce Secretary William Daley to be White House chief of staff was widely seen as a move in that direction; Bryson would seem to be another. Bryson isn't your average utility executive. He was a founder of the environmental group, the Natural Resources Defense Council and worked there his first five years out of Yale Law School. But as one of California's top utility executives, he was a huge proponent of energy deregulation in that state. That deregulation gets blamed for the California power blackouts and other energy crises of the late 1990s and early 2000s which Enron had a role in. But Bryson has said it wasn't deregulation, per se, that led to the problems but way regulators implemented it. innovative approaches to proving the profitability of clean energy. Just before he retired from the company, he launched a plan to turn 65 million square feet of unused commercial rooftops into solar power stations, the largest array in the country, with enough electricity for more than 160,000 homes. Bryson's critics said he was also all about passing on the costs of nuclear power plants that couldn't be recovered to ratepayers and taxpayers so that shareholders wouldn't have to eat them. Bryson's name came up as a possibility for Energy secretary in late 2008 and early 2009 but not everyone found that an appealing notion. Nobel laureate physicist Steven Chu wound up getting that job.